Model various sensors, including: IMU (accelerometer, gyroscope, magnetometer), GPS receivers, altimeters, radar, sonar, and IR. You can mimic environmental, channel, and sensor configurations by modifying parameters of the sensor models. For active sensors, you can also model the corresponding emitters and channels as separate objects. This example shows how to simulate inertial measurement unit (IMU) measurements. 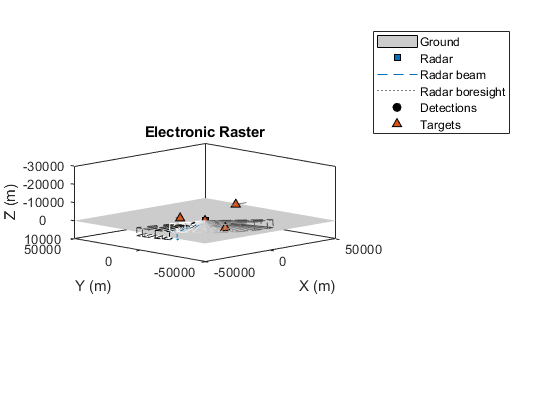 This example shows how to simulate the motion of targets in space using trackingScenario and how to generate synthetic radar detections using monostaticRadarSensor. Model different radar scan modes using the monostaticRadarSensor. This example shows how to configure the monostaticRadarSensor for several commonly used radar scan modes. With this model, you can simulate radars which mechanically scan, electronically scan, and which use both mechanical and electronic scanning. The scan limits in azimuth and elevation are configurable for both mechanical and electronic scan modes. Model and simulate the output of active and passive radar sensors. In this example, you observe how radio frequency (RF) interference impacts the detection performance of a radar. In addition, you use passive radar sensors to estimate the location and type of the RF interference. Magnetometers detect magnetic field strength along a sensor's X,Y and Z axes. Accurate magnetic field measurements are essential for sensor fusion and the determination of heading and orientation.